Tuna Seither has completed the trophy for the New Orleans Bowl … again. 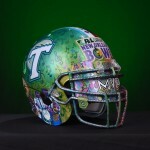 Returning as the trophy artist for the 2013 game between UL-Lafayette and Tulane, Tuna created this work of art for the most valuable player of the game. 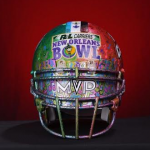 Instead of a traditional trophy, the 2013 R+L Carriers New Orleans Bowl MVP will receive the coveted custom helmet. 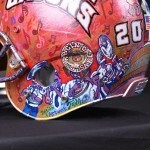 The trophy is etched with scenes of New Orleans and features both Bowl teams with accompanying local themes and images. Guaranteed to impress, this trophy is truly unique to the event and its players. Tuna said that the teams’ cooperation was crucial to his idea. He took great care with the opportunity because the pairing of these two teams in the New Orleans Bowl is really something special to him personally – his father went to Tulane. The first MVP trophy Tuna created last year was heralded as “wonderful” by CBSsports.com. 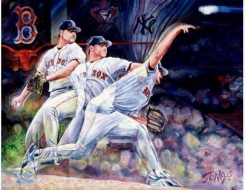 It’s a tradition Tuna hopes to continue repeating. 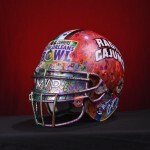 He wants his custom trophies to be one of the reasons teams want to get to the New Orleans Bowl. With his home town as the venue, Tuna is especially honored to have been asked to design the trophy once again. 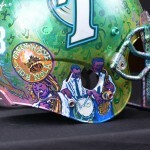 The trophy will be awarded following the match-up between UL-Lafayette and Tulane at the 2013 R+L Carriers New Orleans Bowl on Dec. 21.